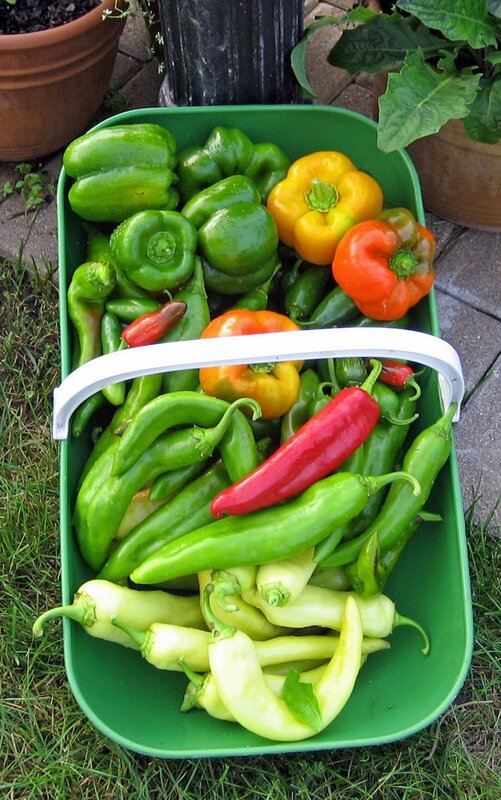 I harvested this basketful of peppers this morning but will refrain from saying “Carol picked a peck of peppers” or anything along those lines. I will cut most of these up and freeze them for use in chili and casseroles later this winter. If I don’t, I will kick myself when I have to pay 99 cents for a green pepper at the grocery store this winter. 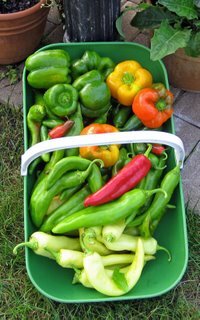 The varieties include Jalapeno M, Sweet Banana, Anaheim, Valencia, California Wonder and Golden Summer. I don’t mind freezing them because honestly, I don’t really like raw peppers, but I do like them as an ingredient in cooked dishes. I also picked a half dozen tomatoes and a bunch of cherry tomatoes, but they weren’t as photogenic as the peppers. There are a lot of green tomatoes hanging on, so if it stays warm and the tomato plants don’t go kaput, I should have some tomatoes all the way up until the first frost. The tomato plants look very, very sad right now, with lots of brown leaves and the weight of all the green tomatoes is pulling down the stakes. Today, by the way, is the 1st day of my “fall vacation” and I am planning to spend much of the week working in the garden. Today, under threat of rain most of the day, I cleaned up a good part of the perennial flower beds, and filled up 3 super sized trash bags with all the refuse. Remember, my compost bins are full, and besides, a lot of one bag is full of perennial sweet pea vines and seed pods which I do not want to compost, because the seeds would probably survive and sprout wherever I used that compost. Yes, I decided that I was nuts to plant the perennial sweet peas where I had them, and so I began the 1st step of rooting it all out today. I will have to be vigilant in pulling up the seedlings that will sprout next spring, and I still need to dig up the “mother plant”, but I am well on my way to not having perennial sweet peas. By the way, we did get about a quarter inch of rain last night, which was just enough to soften up the soil and make it easier for me to weed. For awhile I was weeding without gloves, but then I ran into a grass that had sharp razor like blades, so I was a good girl after that and wore gloves. I wish I knew the name of that grass, but I don’t. I just know (now) to be careful weeding it bare handed. I also mowed the grass, again under threat of rain, and it did start to rain just as I finished, but that little bit of rain is over, and I’m waiting for the next round. We are supposed to get up to 3 inches of rain, and I hope we get about one-third of that. That would make things just about right by the end of the week, so I can do some more digging. I do think on this 5th anniversary of 9/11, it was fitting that it was mostly overcast most of the day. I've seen several garden blogs with thoughts and reflections, here is one from a gardener who works near ground zero. I too am on vacation this week but for me that means a week away from grass cutting and weeding but it's nice to read about someone else doing it. Keep up the good work. Your food looks great. Carol: Thanks for your thoughts. The city has returned to what passes for normal after that very strange sort of "holiday weekend."